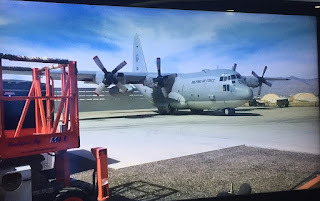 MANILA, -- Two second-hand C-130 planes from the United States worth P1.6 billion and expected to boost territorial defense and humanitarian operations are scheduled to be delivered this year. “We expect the first C-130 by the middle of this of this month, March 15. The Air Force Technical Working Group are in the United States right now,” outgoing Air Force chief Lt. Gen. Jeffrey Delgado told reporters on Tuesday. The Armed Forces of the Philippines is currently modernizing its capability for humanitarian and disaster response and territorial defense amid China’s sweeping expansion in the West Philippine Sea. The other C-130 plane, meanwhile, is expected to be delivered by September. The military transport planes are currently based in Davis-Mothan Air Base in Arizona. They are acquired under the Excess Defense Articles program of the United States. The additional aircraft will raise the number of mission-ready C-130s of the Philippine Air Force to five. The upcoming ex-US Navy C-130T Hercules for the Philippine Air Force.